During 120 years we have been dedicated to the art of the production of canned fish. Our preserves are elaborated by only using the finest raw materials: fresh fish of the finest quality captured in the best moment of the season and always respecting the traditional fishing tackle. For our preserves we select the best fresh fishes. All of our preserves are elaborated by means of a meticulous and handmade process, improved and transmitted all along five generations. Our preserves are covered with specially selected olive oil. This olive oil, with its flavour, adds a unique and exclusive aroma and taste which reminds to the flavour of the sea and the sun dried fields. In sum, the skill and experience acquired over five generations is the key of the exceptional taste and appearance of our preserves. Its aroma, its refined taste, smooth and juicy texture and its white meat make our "La Pescadora" preserves become an exceptional product. What backs the guarantee of our preserves? The "International Food Standard" and the "British Retail Consortium (BRC)", maximum standard of quality, endorse our "Know How" and they guarantee that our products comply with the most stringent food safety requirements. What does "nourishing traceability" mean? The traceability allows to determine the cause in case of nourishing problems and to check the products that suppose a risk for the health of the consumers. Indeed, the traceability systems contribute to reinforce aspects of quality and security, but also commercial and marketing aspects of the food industry. In addition, it makes it possible to identify and differentiate the foods commercialized at world-wide level. Commercial and scientific denomination of the species. Name of the fishing area or rearing area. Net Weight for packaged products. Identification of the consignor or the consignment center. Which are the healthy qualities of the blue fish? "Blue fish" contains some properties of high nourishing and nutritional value that makes it be a basic food for a healthy and balanced diet, advisable for all the ages and physiologic stages. Source of proteins and of diverse vitamins: among others worth mentioning are vitamin A, D, and those of group B, mainly B1, B2, B3 and B12. Food rich in minerals: potassium, phosphorus, magnesium and iron, besides iodine. Rich in linoleic acid and in omega-3 that contribute to diminish the levels of cholesterol and of triglycerides in blood. Also its large quantity of omega-3 fatty acids, can help with the prevention and treatment of cardiovascular, autoimmune and inflammatory diseases. What are omega- 3 fatty acids? They are poly-unsaturated fats, crucial for the health and well-being. Fish is the major source of omega-3 fatty acids, which are considered essential fatty acids, because they are essential for human health but cannot be produced by the body and they should be included in our diet. Omega-3 fatty acids regulate the blood cholesterol and prevent cardiovascular diseases, such as: heart attack or arteriosclerosis. They are also essential for some basic functions of our organism. Control of the blood cholesterol and triglycerides level. They help regulate the heartbeat. They help to control arthritis, asthma and arterial diseases symptoms. They are connected to a good brain health and child development. They contribute to the development of the immune system. The Mediterranean Diet is a synonym for a healthy and well-balanced diet and nowadays is the model to follow in preventive medicine. 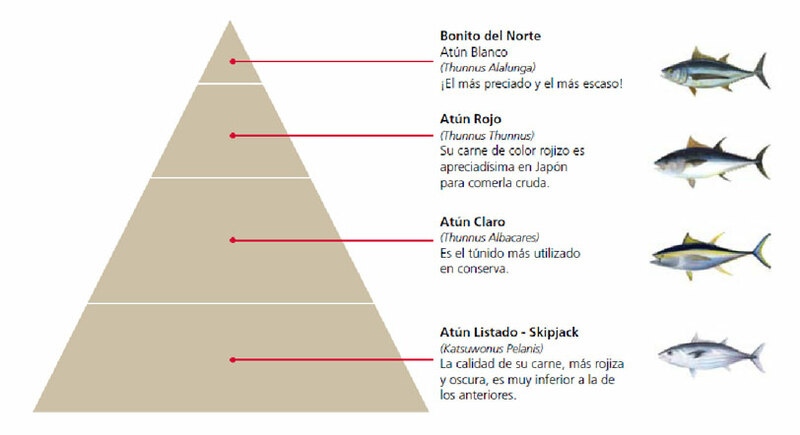 Its characteristic composition is often represented by a pyramid, where cereals, fruits and vegetables occupy the lower positions. In other words, these are consumed more frequently. Fats and proteins have a well defined position, with particular emphasis on the consumption of olive oil, olives and fish. Throughout the year, canned fish products provide nutritional variety to the diet, as a source of first-class proteins, besides providing the necessary fat. The heat treatment of the sterilization process, traditional in canned food, enables a hygienically safe manufacture of the products and maintains the high nutritional values of the fish. Therefore, it is possible to consume, throughout the year and in any geographic location, originally highly perishable foods. The use of refined olive oil has become one of the distinguishing characteristics of Spanish canned fish. Our preserves are made with olive oil. As a consequence, two typical ingredients of the Mediterranean diet are joined and are available to the consumers, making our preserves a naturally healthy product. Does canned fish feed less than fresh or frozen fish? No, canned fish keeps or increases the high nutritional value of the fish. Canned fish can also benefit from the nutritional values of other products, such as: olive oil. How much fish should be eaten per week? It is recommended, to eat fish at least four times a week. Out of these, at least two portions of Blue fish and four for people with cardiovascular problems. Within the most frequently eaten Blue fish species, are anchovies, sardines, mackerel, white tuna, blue jack mackerel and salmon, among others. Preserves in metal cans or glass jars? In metal cans or in glass jars, the preserves have gone through the same manufacturing process. The only differences are the presentation of the product and that metal cans are easier to manipulate. They provide a total protection to the product. They are very convenient in order to store and exhibit them. The glass transparency demands a specially careful presentation and manual packing of the preserve. The greatest difference, with regard to the metal cans, is how the Tuna meat is cut. The cooked and cleaned Tuna loins are manually cut to the desired height. The Tuna loins are lengthwise positioned and the pieces of Tuna, according to the size of the glass jar, are one by one manually introduced inside the jars. As an advantage, you can see the product. They are heavier and more sensitive to shocks. Once opened, they last longer (when they are refrigerated). It is worth underlining that preserves in metal cans or in glass jars improve within time. Which is the difference between fish preserves and semi-preserves? The real preserves last for several years in good consumption conditions. However, semi-preserves are perishable, i.e. they should be eaten in a shorter time limit because they do not go through a sterilization process. Therefore, semi-preserves require special cold conditions in order to preserve a product, such as: anchovies. In any case, the preserving conditions are specified on the product package. How do you know when a preserve is in good condition? Normally, the quality controls of the preserves avoid any manufacturing defect. However, due to problems in the handling process, the transportation or storage of the product, it may be possible that a metal can does not meet all the requirements to be consumed. Never eat the contents of a bulging can or of a can that releases compressed air or pressurized liquid when opened. Refuse cans with holes, leaks or rusty. Distinguish between preserves and semi-preserves, the latter ones should be stored in the refrigerator. Finally, refuse the contents that do not smell or taste as usually. The generic name "tuna" encompasses several kinds of fish. Some belong to the Thunnus genus and are considered to be the real tunas. However, other species with similar characteristics also fall into the group for different reasons. The common names for tuna vary widely depending on the country and region of the world. Here we explain the major distinguishing features of the four most "common" kinds of tuna. Consumers tend to experience a great deal of confusion when trying to distinguish between Albacore and Yellowfin tuna. Albacore is the crème de la crème of the tuna family. The most noticeable culinary difference is that its meat is tastier and its texture exceptionally smooth. Another of its characteristics is that its meat is whiter than that of the other tunas. Albacore also has the advantage of containing a lower percentage of fat: while Yellowfin has a fat content of 10%, Albacore only has 6%. This is the top quality fish of the tuna family. In summer, Albacore approaches the Bay of Biscay in enormous shoals. The fishing hauls made at this time are known as the "Costera del Bonito" catches. Albacore is recognised by its white meat, exquisite flavour and smoother texture than the others of its species. It has a streamline body protected by scales. Its back is dark blue and its underbelly grey and shiny. It also has large pectoral fins. It has an average length of 75 cm and can weigh up to 10-15 kg. Is particularly remarkable for its enormous size given that it is common for Bluefin to weigh more than 100 kg, and some specimens can even weigh as much as 600 kg. Some people call this tuna the "sea cow" and its red meat is highly appreciated in Japan, where it is eaten raw. This is a tremendously voracious fish and an excellent swimmer. It lives in the Atlantic and the Mediterranean Seas. It is fished in May, June and July, while in the Mediterranean for the spawning season. This is a migratory species mainly caught in tropical and equatorial waters. Its pectoral fins are much shorter than those of the Albacore, and it has bright yellow dorsal and ventral fins. Yellowfins can grow up to 2 metres in length and up to 200 kg in weight. It has a large scaly body that narrows towards the tail. This is the most commonly fished tuna, which is probably why it is used so often in preserves. This is a migratory species that lives in tropical and warm seas and oceans, except for the Eastern Mediterranean and the Black Sea. Similar to the Albacore, but with a sturdier body. It has a more oval-shaped silhouette and can be distinguished by the stripes running the length of its body; Skipjack can grow to 110 cm in length and up to 35 kg in weight. It is widely used in preserves and its meat, redder and darker than the others, is much lower in quality.